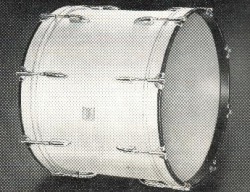 Used by scores of top-flight drummers throughout the world. Now fitted with a completely new type of metal floating-head counter hoop with rounded and reinforced edge, designed to safeguard your sticks. Also redesigned are the sixteen spring-loaded self aligning tension units; now with even greater strength for long wear and even tension. 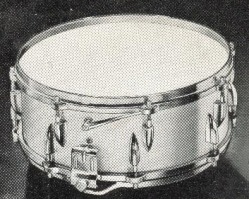 The Pipper's self-aligning parallel snares give it a perfect lay. They adjust at both ends, for maximum volume and tone. Here is unrivalled playing ease and a crisp, resonant tone. The lightest and strongest bass drum of luxury quality on the market. Flesh-hoops half-rounded, giving a handsome, streamlined effect. The twenty spring-loaded self-aligning tension units are heavily chromium plated. Shell of laminated ply of aircraft specification; absolutely no distortion. Heads specially selected and hand finished. 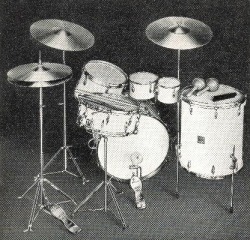 Here is everything the ace drummer could possibly require - the most complete quality outfit available today. Every item is the finest in the Ajax range. The 'Universal' outfit has been specially designed for the drummer who wants to obtain the widest possible range of effects. NEW FINISHES. 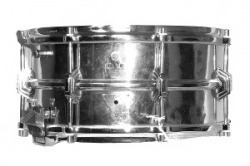 All Ajax drums are now supplied in gleaming Nacralaque in white, grey or pastel green. Also in white, cream or black Celastoid. Please specify finish and colour when ordering. This brilliant outfit is widely regarded as the finest made anywhere today. Into it Boosey & Hawkes have incorporated every refinement of manufacture and finish. 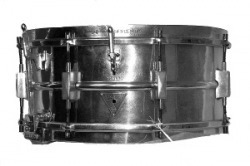 The combination of these superlative Ajax drums and fittings is an outfit of the highest professional standard - immensely strong, elegant and musically perfect. The drums have completely redesigned self-aligning fittings, giving greater strength. And they are finished in the new, more luminous Ajax Pearl Nacralaque.